August | 2017 | "Let's Talk, New York!" CORRECTED VERSION: “How Free Can We Be?”: Wed., Sept. 13, 5:45, Adelphi University Manhattan Center, 75 Varick St., 2nd floor. Do you like Apricot Martinis? Jean-Paul Sartre, Simone de Beauvoir, and Albert Camus did — and we’ll be inspired by their Existentialist Cafe* as we share our experiences, knowledge, and wisdom about how we might become more autonomous, aware, and true to ourselves. *Inspired by At the Existentialist Café: Freedom, Being and Apricot Cocktails, by Sarah Bakewell. 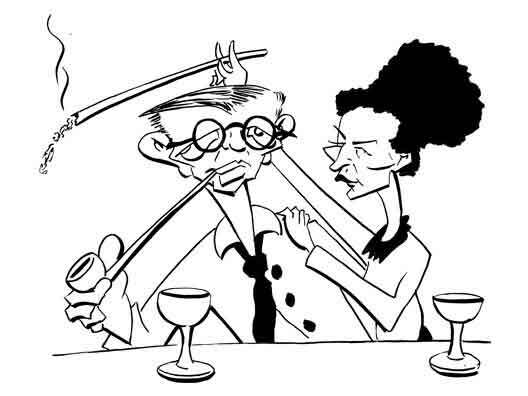 Cartoon is of Sartre and de Beauvoir. “How Free Can We Be?”: Wed., Sept. 13, 5:45, Adelphi University Manhattan Center, 75 Varick St., 2nd floor.